soleil mirror. art deco mirror. poillerat style mirror. over mantel mirror. Mirrors are manufactured by applying a reflective coating to a suitable substrate. The most common substrate is glass, due to its transparency, ease of fabrication, rigidity, hardness, and ability to take a smooth finish. The reflective coating is typically applied to the back surface of the glass, so that the reflecting side of the coating is protected from corrosion and accidental damage by the glass on one side and the coating itself and optional paint for further protection on the other. The method of making mirrors out of plate glass was invented by 16th-century Venetian glass makers on the island of Murano, who covered the back of the glass with mercury, obtaining near-perfect and undistorted reflection. For over one hundred years, Venetian mirrors installed in richly decorated frames served as luxury decorations for palaces throughout Europe. The secret of the mercury process eventually arrived in London and Paris during the 17th century due to industrial espionage. French workshops succeeded in large-scale industrialization of the process, eventually making mirrors affordable to the masses, although mercury’s toxicity remained a problem. In modern times, the mirror substrate is shaped, polished, and cleaned, and is then coated with silver or aluminum. 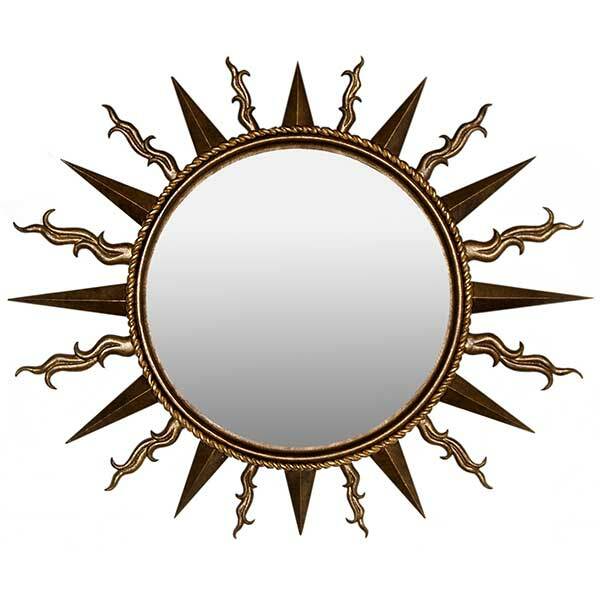 The Vergina Sun, a rayed solar symbol appearing in ancient Greek art from the 6th to 2nd centuries BC, was the source of inspiration for the Soleil Mirror. The Vergina Sun appears in art variously with sixteen, twelve, or eight triangular rays. Constructed of robust metal, the mirror frame is offered in a variety of finishes and accents. With Art Deco overtones, the Soleil Mirror makes a grand wall accent for upscale residential and hospitality interiors. Custom sizing is available.